St. Thomas’ Church (Stockton Parish Church), High Street. In churchyard, in south west corner. Unveiled May 31st 1923 by John Frederick Lambton, Earl of Durham; Dedicated by the Bishop of Durham. 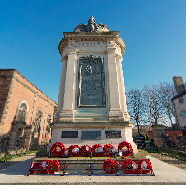 Cenotaph, 9.14m (30 feet) high, 3.65m (12 feet) wide, 2.43m (8 feet) deep, four-square with pillars dividing the sides. It is topped by a cap with a bronze pinnacle, and a bronze crest in front. On the front main face is a bronze panel with fluted edge and swags at the top. At centre top is a wreath with the arms of Stockton, and below is the dedication. On a smaller panel below are the details of the book of remembrance. The whole is set within a delicately wrought iron railing. To the lasting memory of the men of Stockton on Tees who fell in the Great War 1914-1919. They died the noblest death a man may die fighting for God and Right and Liberty and such a death is Immortality. See to it that these shall not have died in vain. The names of the fallen are inscribed in the book of remembrance laid up in the adjoining church. War Memorial Committee, Chairman, Sir Frank Brown, J.P.
Public subscription, led by the Mayor. Donations were made by Ropners, the shipping firm; Harrisons the printers; South Durham Steel and Iron Company and Castle Brewery. The Chairman of the War Memorial Committee handed the care of the memorial to the Mayor at the unveiling, and the Mayor accepted it on behalf of the town. 1. The site of the memorial in the north-west corner of the churchyard, which was already closed and maintained by the local authority, involved the purchase and demolition of 16a High Street and two cottages to provide an open site for the memorial. The cost would be over and above the cost of the memorial itself. 2. The memorial contains a “time capsule” built into the base, containing a copy of the Roll of Honour and copies of the London Gazette announcing the Proclamation of War and the Armistice – all sealed in a bronze box. 3. The list of casualties was said to total 1,223 with 287 of these being DLI soldiers. 4 The photograph of the unveiling ceremony has on the reverse that penciled note that the memorial was unveiled on May 31st 1923. 6. The total sum raised was £11,864 18s 10d which, after deducting the costs of the memorial, inc. £500 architects' fees, left a balance of £4,429 18s 10d for the educational part of the scheme which, it was hoped, could be raised to £5,000. 7. Lieut. E. Cooper, V.C. and Sergt.Major Tosefield, a disabled soldier, were selected to lay a wreath at the unveiling ceremony. 9. 25,000 people attended the unveiling, including 8,000 children. 10. Relatives of casualties received medals at the unveiling ceremony. 11. A travelling museum for schools and public talks was created to mark the 75th anniversary of the unveiling of the memorial. Illustrated Chronicle 01/06/1923 carries photos of unveiling. Northern Echo 08/02/1923 reports proposals in Notes 1 and 5 above; 08/02/1923 reports proposed unveiling and Note 6; 30/05/1923 reports further arrangements; 31/05/1923 reports proposed unveiling; 26/04/1998 reports 75th anniversary exhibition. Darlington & Stockton Times North 16/10/1920 reports appointment of architect; 03/02/1923 reports progress; 10/02/1923 reports proposals for unveiling; 02/06/1923 reports unveiling. Darlington & Stockton Times South 02/06/1923 reports unveiling. Stockton and Teesside Herald 17/12/1921 reports proposals. Evening Gazette 1987 reports that the Cenotaph would be closed off to the public apart from official ceremonies because of “scandalous and distressing” vandalism. Graffiti were being daubed, litter left, flower beds damaged and the site was used as a urinal. Stockton Reference Library File of correspondence from the War Memorial Committee prior to erection of the cenotaph. Diocese of Durham Faculty 1079, issued 14/07/1922 for the erection of the memorial.Faculty number 6573, issued 08/08/1987, for alterations to the Cenotaph, moving the railings and paving in an attempt to reduce vandalism, the work being paid for by the Borough Council. See to it that these shall not have died in vain. Certificate sent to all bereaved families under the George V cipher and coat of arms.